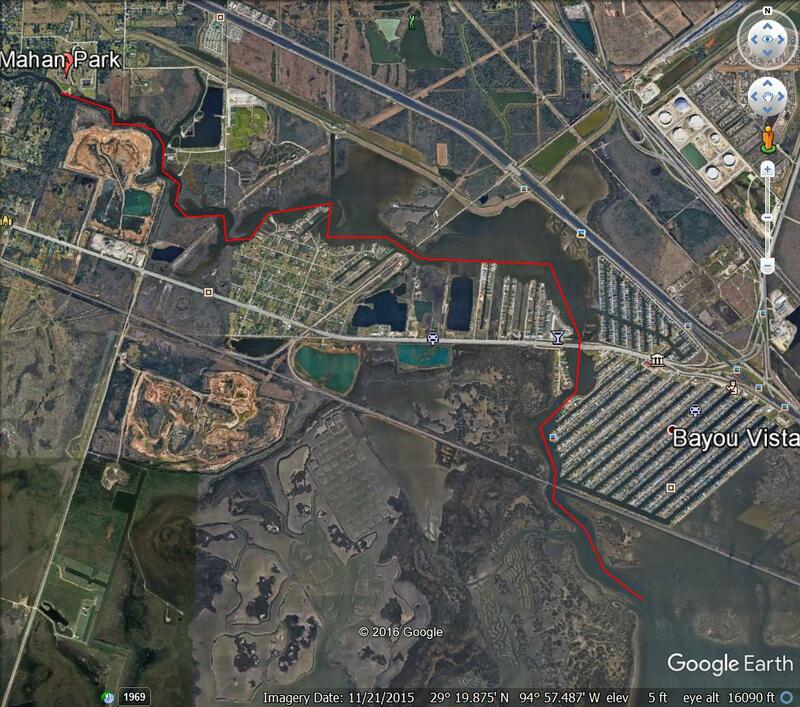 Highland Bayou drains into Jones Lake which is part of Galveston Bay. If the wind is not strong, we will paddle into Galveston Bay, stop on some sand bar to have lunch and return. If there is a strong southeast wind, we can go upstream for a short paddle, but I am hoping for the longer trip. Because of wind/length, I am calling this a level 2 trip. 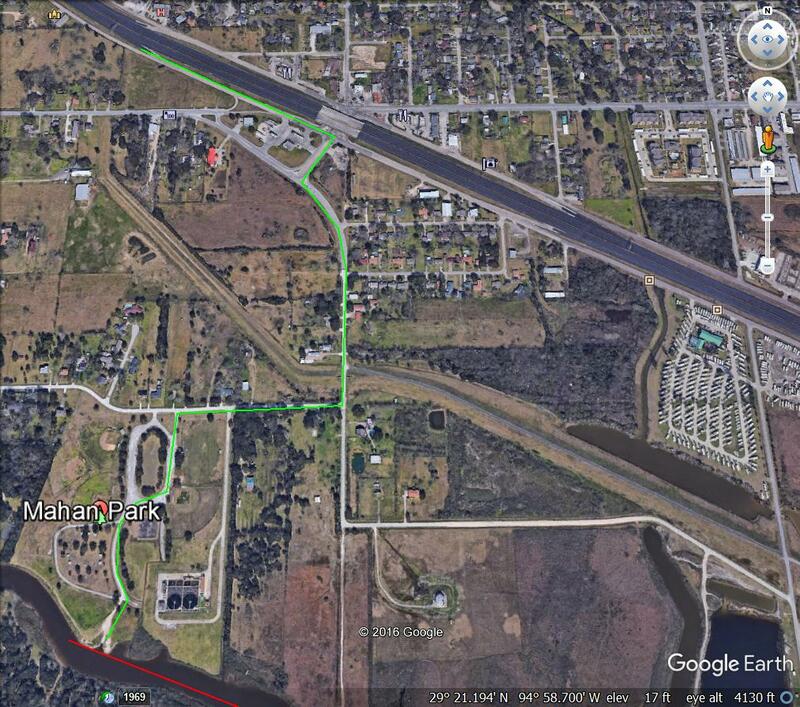 Directions: Exit the Gulf Freeway at Exit 10/Highway 519. From the southbound feeder, go right (West) at 519, but don't take the second curve to the right on 519 - proceed straight ahead to the T-intersection, where a brown park sign, to Highland Bayou and Mahan Park, directs you to turn left. This is Lake Road. You will go through a cut in the flood control levee, and then make the next right turn on to Woodland Road (there's a brown sign here to Mahan Park). A quarter mile or so down Woodland Road, you will see Mahan Park on your left. Go in the second of the two entrances, past the ball fields, less than a quarter mile total distance to the gravel turnaround parking lot that you can see when you clear the ball fields. The boat ramp is at the end of the gravel turnaround. Unload, and move your vehicle so boat trailers have plenty of turnaround space from the lot. Meet by 9:30 for paddles wet at 10:00. This is an ACA sanctioned event. All participants in ACA-insured activities must wear properly-fitting U.S. Coast Guard-approved lifejackets (Personal Flotation Devices, or PFDs) at all times during on-water activities. Non-HASK participants must sign a waiver.is an ACA sanctioned event. Hazards -- Sunburn,windburn, hypothermia, pilings, boat traffic, jellyfish, stingrays, fire ants. We may have a short portage over railroad tracks if the water is very high (unlikely). We will try to avoid hazards. Most importantly, bring plenty of water, A DRY BAG WITH SPARE CLOTHING (NO COTTON) sun protection, rain jacket and snacks.